Men work on an oil pump during a sandstorm in the desert oil fields of Sakhir, Bahrain, Jan. 8, 2015 (AP photo by Hasan Jamali). On April 1, Bahrain announced that it had made a huge discovery of offshore oil and gas in the Persian Gulf that far exceeds its current reserves. 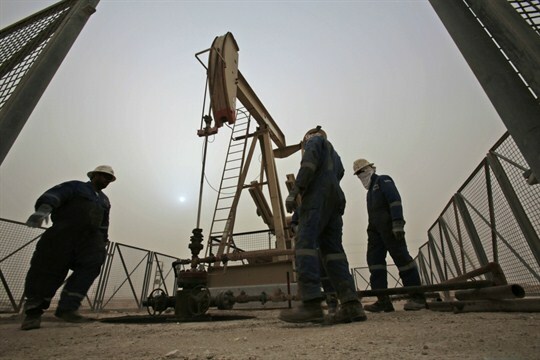 Drilling by two U.S.-based firms confirmed that the Khaleej al-Bahrain basin may contain more than 80 billion barrels of shale oil and around 13.7 trillion cubic feet of natural gas. For the cash-strapped government in Manama, which has faced a mounting fiscal deficit and nagging social pressures, the news came as a major relief.